The Unmutual Website is indebted to David Stimpson and Darren Stokes for the latest news concerning the Breda, AKA MS Polotska in "Checkmate" and "Many Happy Returns". 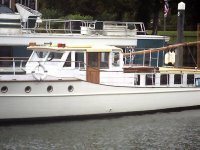 The photo left is of the boat as it is today (moored in Middlesex). Recently, spotted David, the boat took part in The Queen's Jubilee celebrations on the Thames! For more information regarding Breda, click HERE. With thanks to David Stimpson for this news item and Darren Stokes for the photo.